Most everyone loves going out to dinner, but with budgets continuing to be tight for many consumers, finding ways to cut back is important. But this doesn’t mean you can’t continue to enjoy amazing restaurant recipes. Thanks to the many talented home cooks out there spending time cracking the secrets of these restaurant recipes, many of these awesome recipes are now available to cook at home. We’ve put together another collection of fantastic restaurant copycat recipes to explore cooking in this latest free eCookbook, 24 New Top Secret Restaurant Copycat Recipes. Though these restaurant copycat recipes aren’t exact replicas they’re close and delicious enough to wow family and friends with. Check out one of these 24 New Top Secret Restaurant Copycat Recipes with copycat recipes from Cracker Barrel, Olive Garden, Chili's and many more. You can find dinner ideas, dessert recipes and appetizers, like Hard Rock Cafe's Twisted Mac N' Cheese, Wendy's Chili and Cracker Barrel's Copycat Grilled Chicken Tenderloin. While you’re here on RecipeLion, subscribe to our free Quick and Easy Recipes newsletter to get free recipes delivered to your inbox every week. Make your favorite restaurant dishes in the comfort of your own kitchen! Download your free copy of 24 New Top Secret Restaurant Copycat Recipes! Still can't get enough copycat recipes? Don't miss the entire RecipeLion collection of Copycat Restaurant Recipes! Click here to download the 24 New Top Secret Restaurant Copycat Recipes free eCookbook now. Everyone loves the comfort of Cracker Barrel recipes, the addictive element of Krispy Kreme doughnuts, and the familiar taste of KFC classics. That's why it's no wonder that this eCookbook is one of the most popular in the RecipeLion collection! Our readers loved this collection so much that we are re-releasing it with brand new copycat restaurant recipes. So, in our eCookbook, 24 Top Secret Restaurant Copycat Recipes, we’ve collected some old classic favorites plus added new copycat recipes you're sure to love. This eCookbook, 24 Top Secret Restaurant Copycat Recipes, includes a sampling of tasty appetizer recipes, delicious and easy dinner ideas, and other restaurant copycat recipes you'll recognize from your favorite eateries. You’ll be sure to find some unique treats that everyone can enjoy, like Just Like Panda Express Orange Chicken (p. 6), Wendy's Chili (p. 27), and so many more! For more awesome copycat recipes, be sure to visit RecipeLion.com. While you’re there, subscribe to RecipeLion’s free Quick and Easy Recipes newsletter to get free recipes delivered to your inbox every week. Just Like Panda Express Orange Chicken (p.6) - All the flavor of Panda Express orange chicken, but a fraction of the cost and calories! You'll be surprised at just how easy this restaurant copycat recipe is. Irresistible Baked Bloomin' Onion Knockoff (p.9) - Who doesn't love the bloomin' onion at Outback Steakhouse? With this step-by-step tutorial, you can easily make it for your next party. Just Like Bob Evan's Chicken Noodle Soup (p. 20) - You can't get much more comforting than this restaurant copycat recipe. The ingredients cook together in your slow cooker! Wendy's Chili, Our Way (p. 27) - Nothing compares to Wendy's Chili, and that's what makes this recipe so popular. Plus, it's super easy to make with just three simple steps. 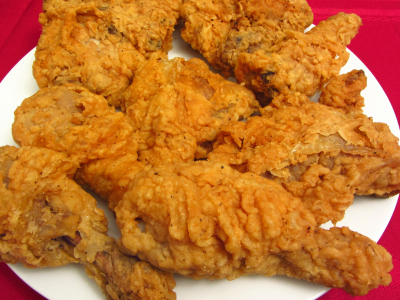 KFC Inspired Fried Chicken (p. 24) - Master the art of making fried chicken - with a special spice blend that's scarily similar to KFC's famous chicken! You'll never go back to any other fried chicken recipe. 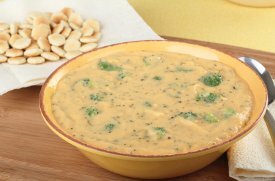 Panera Bread Broccoli Cheddar Soup (p. 39) - Don't you just love Panera's broccoli cheddar soup? If yes, then you've got to try this restaurant copycat recipe for the creamy, cheesy soup today! For once, we are more than happy to be called copycats, especially with these delightful restaurant recipes. We made our way into restaurant kitchens, hiding in freezers, wiring their phones and spying anyway we could to find out their “secret” recipes. Tired of restaurants’ fanfaronade, we decided that these recipes had to be shared with everyone, all so you could make them in the comforts of your home. They put up a fight, but we were able to crack the case and find out what made these copycat recipes so popular. In 24 New Top Secret Restaurant Copycat Recipes, you’ll find some of the best copycat recipes that will remind you of your favorite places to dine-out. We’ve collected some wonderful dishes to cover every aspect of your dinner. With mouthwatering appetizer recipes to start off the night to decadent desserts to bring the night to a wrap, these restaurant recipes will give you the sensation of going out to dinner without ever leaving the house. You can make these in your own home and never have to change in to your fancy going-out pants. You don’t have to be a master chef to prepare these fan-favorite recipes. Quick, easy and delicious, after your first bite, you’ll wonder why you ever started going out to eat in the first place. If you’re on a budget, but love to go out to eat, our 24 New Top Secret Restaurant Copycat Recipes free eCookbook is just for you. Even with the best restaurant deals out there, it always seems like you spend more than you planned. There’s the price of drinks and appetizers if you feel like starting off the meal with a little snack. And who can ever say no to dessert? With all of these things added together, plus a tip for the server, going out can cost quite a bit of money. We tried our hardest to recreate some of your favorite copycat recipes in our brand new eCookbook. The restaurant CEO’s may not be happy with it, but RecipeLion is here to help you save a buck. Even if you don’t consider yourself to be the strongest chef, we guarantee that you will be able to make these copycat restaurant recipes. Olive Garden Copycat Lasagna - Garfield isn't the only one who loves lasagna. Try this copycat recipe for Olive Garden's classic Italian dish. Olive Garden Copycat Lasagna won't leave you wanting more. Olive Garden style Black Tie Mousse Cake - This copycat recipe for Olive Garden-style Black Tie Mousse Cake is as decadent and delicious as the real thing, but easier and cheaper to make! Copycat Cinnabon Cinnamon Rolls - You know that irresistible smell when you walk past a Cinnabon store? You can have that amazing aroma in your own kitchen with this recipe! It's one of our best yet. Plus many more Restaurant Copycat Recipes! Download your free copy of 24 New Top Secret Restaurant Copycat Recipes today! If you enjoyed this free eBook, you won't want to miss any of our other downloadable recipe collections. You can browse our entire library of free eCookbooks here. Weekly emails with free recipes, tips, collection pages, videos and more + a weekly wrap-up. How do I ask question about BBQ chip Meatloft from show two days ago? whats your question I have worked in all kinds of restaurants maybe i can help. I am having the same difficulties as everyone else - takes me to copycat recipes. I have Bitdefender - prevents spywear, adweare, etc. What I think is- every time I click on to a recipe, this darn book shows up & I never see any of the recipes! This is getting real old! I am having the same problem. I click on a recipe I was to look at & it does not come up like it used to. I am hoping the problem will be fixed soon or I may give up on Recipe Lion. I too am having trouble viewing the receipe I click on--it takes me to17 New Top Secret Restaurant Copycat Receipes. Also when I try to save an e-book cookbook it opens it in Word & I can't convert it to Adobe. Anyone else having trouble? Yes, I too always have the same problem! Sent an email today to RecipeLion about it. Hope they can fix this. It used to be the Pork Chop Page always came up, now it's Top Secret Recipes.. I can't wait to try recipes from some of my favorite restaurants at home. Looks great and I am delighted to have the opportunity to download the cookbook. Thanks for offering it!